World Class Bathtub Refinishing and Tile Refinishing is the most cost effective way to remodel your commercial bathrooms. SAVE up to 80% over replacement cost! Now more than ever, Commercial Bathtub and Tile Refinishing has become the quickest and most economical way for Hotel and Motel owners to give their guests a modern, clean bathroom with minimum cost. In addition to a cleaner, more modern looking bathroom, housekeeping is quicker and easier when a bathtub and surrounding tile walls are refinished together, because mold and mildew do not form in grout lines or caulk lines. 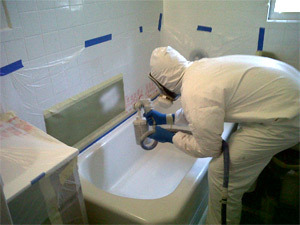 When it comes to Commercial Bathtub Refinishing we are the Experts! Frank’s All Surface Refinishing has been the South Florida leader in Commercial as well as residential Bathtub Refinishing for more than 18 years! There is no need to remove or replace bathtubs, sinks or vanities when remodeling Commercial bathrooms. Dull, stained, chipped tubs or out-of-date colors are the most common reasons for bathtub or bathroom fixture refinishing. Even chips and scratches can be beautifully repaired - quickly and inexpensively. By choosing Bathtub Refinishing over replacement with Frank’s All Surface Refinishing you will Save up to 80%, you can apply these savings in other areas of your remodeling plans. With our high tech performance Bath Tub Refinishing products and procedures we can repair almost any porcelain bathtub, fiberglass bathtub, ceramic bathtub, or acrylic bath tub. Ceramic tile can be repaired and resurfaced as well, allowing for complete bathroom color changes in a matter of hours, without disrupting the walls, plumbing or electrical work inside of a bathroom. Bathtub Refinishing usually takes 3-4 hours to complete from start to finish so your rooms will be ready for occupancy the very same day unlike bathtub remodeling which takes days to complete!! How can the FRANK’S ALL SURFACE REFINISHING Help your Company ? We can refinish virtually any hard surface. We can help you SAVE up to 80% over replacement cost! We know that commercial properties need to ensure that their properties maintain a pristine appearance. Frank’s All Surface Refinishing supports the needs of your commercial properties with services that could help you increase revenues $75-$200 per month. We understand that each day your room is down is lost revenue. We do all we can to avoid this. We understand commercial accounts have specific needs and concerns when initiating a project, particularly regarding the time required and the impact on space during high-occupancy periods. FRANK’S ALL SURFACE REFINISHING Team is made up of our most experienced Refinishers ensuring affordable speed and the best quality possible not possible by Franchise operations. Best of all no franchise fees are attached to your cost! You will have a uniform refinishing procedure for all your properties without additional franchise costs. We work expertly around your property’s constraints and nuances. We understand the balance between the front desk, engineering, and housekeeping. We know how to work within that environment without getting in the way. We accommodate your time-table and occupancy patterns, making the process as convenient as possible. We offer ideas and solutions for renewing or updating bathrooms and kitchens as an alternative to making costly replacements. Ready for use in as little as after 4 hours. Prospective tenants or guests notice a bath area that looks new and that has been updated. No mess is left behind. The ability to work with engineering, housekeeping and front desk to ensure quick turnaround. Last But not least is Experience! There is no Miracle to any method. Just hard work and cooperation with your staff which will lead to a quick and successful cost effective refinishing project. With vacancy rates as high as they are now we help give property managers, hotel managers and building owners a competitive edge by providing bathrooms and kitchens that shows like new. We pride ourselves on being able to offer very competitive commercial rates while never compromising on the good quality workmanship that our clients have come to expect of us. Low prices, the best service, and good workmanship are a combination that makes us tough to beat.